Sardinia, Italy. Friends and family hadn’t heard of it, travel bloggers hardly visited it, and I’d been dreaming of it for the last two years. Ever since I’d learned about Blue Zones, pockets around the world where the highest concentrations of centenarians lived (people who lived to be 100+), I’d imagined Sardinia as a kind of utopia: families welcoming us into their homes with minestrone simmering on the stove, yoga on pink sand beaches, freshly caught seafood proudly displayed in picturesque markets, and campgrounds brimming with like-minded travelers from all over the world. What I found instead? Let’s just say it surprised me. Here are six things no one told you (or me) about traveling to Sardinia. Travel + Leisure recently shared the Best Beaches of Italy, a list of the country's "best sun, sand, and scenery." The publication listed Positano, the islands off of Sicily, the beaches of Northern Italy, and two mentions of Sardinia. Is the secret out, I wondered? One look at the waters of La Maddalena or the Emerald Coast and you'll discover why mainland Italians have kept this island a secret for so long. A lack of tourism from beyond Italy has kept Sardinia widely untouched, even a bit unruly. Roads, despite being well maintained, are not designed to speed tourists around the island, but rather for its inhabitants and seasonal visitors to take it slow, savor the sights, and experience the difference of Sardinian life. Here, the tourist season is limited to the summer months, so if you're visiting outside of those, expect to have picturesque beaches, trails, roads, and waterways to yourself. But as we found out - this is both the blessing and the curse of Sardinia. Despite being a popular destination for Italians, much of Sardinia is still shrouded in mystery. Take the 7,000 nuraghe that dot the island. These ancient, iconic structures serve as a symbol of Sardinia's distinctive culture. They're not found on mainland Italy, only on Sardinia, and they date back to 1900-730 BCE. Ancient Rome was founded in 753 BCE and dissolved in 476 AD to give you a sense of Sardinia's history. But that's where it ends. There's no real consensus, scientific or otherwise, as to what role the nuraghe served. The naming of these structures is in itself uncertain, the buildings may be named for a city or for their stone and mud composition. Their function is equally unknown, some believe they were residences, military outposts, event venues, or religious spaces. The only thing certain is that they are everywhere - lining the coast, the farmlands, and the hill tops - making them a symbol of the island despite a clear understanding of their role. The nuraghe were the first of many mysteries during my time on the island. Everything started off great. We arrived close to midnight at our Airbnb in Alghero. The B&B accommodation featured all white guest rooms, and a friendly host, Matteo, who had arranged our cab from the airport, and welcomed us with bespectacled, big brown eyes, despite our late arrival. Matteo provided us with a map of the town, restaurant recommendations, and a communal kitchen complete with fresh fruit, yogurt, coffee, granola, and juices to start our day. The next morning, we prepared a light breakfast in Matteo's kitchen and climbed the spiral staircase to the rooftop. The view from the top was incredible; we couldn't have been more excited about the week ahead. If you're going to Sardinia, I can't recommend this Airbnb highly enough. We took an early morning walk along the port of Alghero, absorbing its history. We wandered through cobblestone streets, admired towering churches, and practiced our best buongiornos, waving good morning to the people we passed along the way. We were charmed. We’d planned a 5-day road trip in a vintage VW Van rented from Cool Campers. We met Antonio and Amandine, the owners of Cool Campers, later that morning. Not only were they extremely helpful during the booking process, but when we met, Antonio provided us with a detailed overview of the rental van which he affectionately named "Anna," after his mother. She was a 1977 Westfalia complete with a pop top, olive green plaid upholstery to match her exterior, and two options for sleeping. Antonio also provided us with a map of the entire island and helped us plot our course. All signs were still pointing to a great week ahead. I’ve experienced off season in places like Barcelona, the Canary Islands, Belize, even Kauai. My husband and I often travel during these times of year because of his schedule as a Chef/restaurant owner, and because vacationing in crowded places really isn’t our thing. We typically get the added benefit of cheaper flights and better availability when booking hotels or vacation rentals. Sometimes, inclement weather may limit our travel plans, but we try to choose destinations with consistent temperatures year round. Likewise, some activities or restaurants may close for the off season, but we’ve always found a good variety in the places we stayed in the past. That is, until we set off to explore Sardinia beyond Alghero. It felt as if much of the island was shuttered for the off season. Our itinerary would take us from Alghero south to Bosa, and then clear across the island to the Emerald Coast, where we’d travel north to La Maddalena before making our way back to Alghero along the coast. It didn’t seem that ambitious, but when we discovered just how quiet the towns between Alghero and La Maddalena would be, we found ourselves hungry and sleep deprived. There was no doubt about the island's beauty, but despite well-meaning guidance from the owners of Cool Campers, town after town had all but shut down for winter. Sure, those first few days were overcast, but with highs in the 60s and low 70s, this couldn't possibly be winter, could it? Countless restaurants didn't open at all, while a few exceptions opened a couple of days a week without posted hours. Dining out was a guessing game. Siestas were longer (yes, many countries in this part of the world siesta), and days were shorter. Campgrounds were closed too, and the recommended app, Park 4 Night, took us on multiple hopeful goose chases that time and again ended in locked, gated, or entirely missing campgrounds. With nowhere but roadsides to park our van, and nowhere to plug in for the night, the perishable food we’d hoped to cook spoiled. Traveling in a camper van can be a challenge, one that relies on campgrounds and public restrooms for some basic needs. Along with a list of add-ons to our VW rental (beach towels, shower towels, GPS wifi, etc), we added a chemical toilet to our reservation as a back up. It was a just in case, probably-wouldn't-even-need-it afterthought. Thank goodness. It would quickly become my favorite toilet on the island. I mean, just look at these views from my potty. One thing no one tells you about Sardinia is that toilet seats are extremely hard to come by. Sure, there are restrooms, but all of the toilet seats have somehow gone missing. Nine times out of ten, all that remains is a big old toilet bowl daring you to take a seat. I took the plunge at least once a day (nature calls), and let me tell you, hovering above countless toilet bowls left me utterly defeated. What’s more, many restaurant bathroom stalls were huge, with toilet paper located in the most inconvenient, hard to reach places, especially on hover. It was so absurd that my husband and I began rating toilet seats one to five stars, and let’s just say there were no five star toilets, except for the nights we stayed in a hotel or B&B. The nicer the restaurant, the worse the toilet, you could count on that. The best of the worst, believe it or not, the only four star toilets we found, were in gas stations and breakfast cafes. We thought about developing an app, Place 2 Pee, that would be more useful than the Park 4 Night app that never led us to any open campgrounds. At least, Place 2 Pee would give users a map to the hidden toilet seats of the island. So why the lack of seats? Some sources say Italians are so hygienic that using a public restroom is so off-putting, that many resolve to stand on the seats to avoid germs. The seats literally crack under pressure, and shop owners are left with an impossible task: replacing the seat. Italy apparently has no regulation amongst its toilet seat models and has so many that finding a match is a challenge most shop owners don’t bother with once they’ve had a seat broken. Do I believe this? Not really. I can’t imagine that a model number isn’t included on a toilet, and that a seat wouldn’t be available to order online. To me, the case of the missing toilet seats was another sign of tourist fatigue which we experienced often on the island. It was that same sense of annoyance that we needed help deciphering a menu. It was the absence of a greeting upon entering a restaurant, not so much as a friendly smile, or a check-in to see if we needed anything after our meals arrived. It was cars speeding past us, gesturing wildly (did I mention we were driving an olive green camper van? We were tourists, alright). The irony was that we weren't part of a throng of tourists, the type that disembark from cruise ships in the thousands to descend on small towns. From what we could tell, there weren't many of us at all this time of year. And we did our best with basic Italian. We’d never really experienced this in other countries (especially not when Obama was president), and it didn’t make us feel welcome. The lack of infrastructure on the island compounded the issue. Let me set the stage. We were parked in the camper van awaiting the next ferry over to La Maddalena. It was pouring, and along with the rain, my tears flowed. The glimmer of hope I’d had felt so out of reach — we’d purchased a hotel for the night — mostly for a chance to use a toilet with a seat and get a hot shower, but finding it proved to be another plot twist. We had just paid 52 euro to travel by ferry to La Maddelena. When we arrived on the island, my GPS instructed us to turn back around, our destination was on the island we’d just left. So we took the ferry back to our starting point, recalibrated, and the GPS told us for the second time, that our destination was on the island we'd just left. I wiped my tears and sauntered back into the ferry station. The same guest service agent who had helped me buy the original ticket was eating a pre-packaged ice cream cone as I approached, wiping tears from my face and rain from my jacket. “Me again. Hi, so we got very confused…” I explained the GPS and the confusion, and how we’d just gone across the water only to come right back and be directed to go back again, and could she please provide us with a pass to cross over again? Deflated, I paid the fee and returned to our van, the rain still pummeling down. When we finally made it to our hotel on La Maddelena, we were relieved to find a toilet seat and a hot shower waiting for us. Although I practically melted down during the 2+ hour ferry ordeal, the hotel, Residenza Mordini, was a welcome respite. The owner offered us a variety of rooms, and brought us a spread of croissants and tea as an afternoon snack. A buffet breakfast was thoughtfully prepared and included eggs made to order. I took my time in the shower. Full-sized bath products, white linens, and slippers, made the experience luxurious. I emerged from the bathroom with renewed hope that the next few days would be better than the last. After all, we were on an island in the middle of the Mediterranean, a destination renewed for its quality of life and access to fresh food. We'd just come from Tel Aviv, where fresh fish plucked right from the Mediterranean landed on our plates nightly, yet here in Sardinia, fresh fish was much harder to come by. Finding a restaurant that was open in the off season was the first challenge. The few restaurants we did manage to dine in were mostly misses, with asterisks all over the menus signifying that seafood was previously frozen. We quickly learned that pizza and pasta were the best options. Even the pasta dishes were hit and miss - instead of plump handmade gnocchi - we were served gnocchetti, which more closely resembled Kraft Mac & Cheese noodles. And then there were the times my husband was served frozen lasagne. After inserting his fork into the frozen entree, the server unapologetically took it back to the kitchen. When he returned 15 minutes later with a still frozen lasagne, we felt like we were on hidden camera. I have to imagine that during the tourist season, the food is fresh. Having just come from Tel Aviv, and heading to Valencia next, we knew that it was possible to prepare fresh fish and seafood year round. This was a major disappointment on an island heralded for it’s diet and lifestyle. The concierge at Residenza Mordini had recommended a restaurant called La Perla Blue for it’s location looking out on the pier. Along the way there, we walked through beautiful picturesque plazas where kids gathered in costume to celebrate Halloween. The town was beautiful - illuminated at night, with many shops open late and handing out candy to children. It really was a promising scene - and even the rain had stopped. We had a bit of time still before the restaurant would open, so we ducked into a wine shop. The warm, intimate space featured a binder of regional Italian wines - the first we’d experienced in three days. Most restaurants offered only a white or red house wine in lieu of a list, so it was thrilling to have a binder of options in front of us. The service was also extremely warm, it seemed as if the gentleman helping us was also the owner. With each glass of wine he brought to the table, he provided a spread of baked finger foods - a small nibble that meant a lot to us. We’d stumbled upon a gem, of that we were sure. On our way out the door, we asked about La Perla Blu - was that the best place to dine that evening? The owner was careful with his words and suggested a few other places we might try instead. Unfortunately, none of his suggestions were open that evening. Reluctantly we decided to give La Perla Blu a try. It was one of the worst dining experiences we’ve ever had. We were seated on a beautiful, tent-walled outdoor patio overlooking the port, sharing the space with only two other occupied tables. It really was a beautiful setting. Ash trays were part of the table setting, and before long we realized we should have opted to sit inside. The cigarette smoke engulfed us. I ordered the mussels because they were asterisks free which meant they were fresh, except when they arrived, their smell proceeded them. The mussels were tiny and as chewy as bubble gum. Many of the shells were broken or empty, and the crouton was so hard, I couldn't get a bite of it. When I let the server know the mussels weren't my favorite, she simply walked away. The manager appeared, explaining to us that there was nothing wrong with the mussels, that they were fresh, and that they were properly cooked. We decided to cut our losses, paying for the mussels and my husband’s salad, and walked back out into the night in search of better fare. Eventually, we found a small eatery with no English translation on the menu. I had an inkling this might be a better experience already. It was off the main drag of the island and our server only spoke Italian. We made our selections and sure enough, simply prepared, fresh pasta did not disappoint. For the rest of our time on La Maddalena, we avoided seafood and stuck with pizza and pasta. I wasn’t sure if this was the diet of people who lived to be 100+, but I couldn’t imagine that frozen seafood was on their menus, either. I never found a bowl of minestrone, which was supposedly one of many Blue Zone elixirs found here, but we did find a wonderful, homestyle dining experience on our last night in Sardinia. We'd checked back into our Airbnb from night one and our Airbnb host, Matteo, getting an earful about our dining experiences, promised us his recommendation wouldn't disappoint. For a glimpse of the Blue Zone in Sardinia, head directly to La Botteghina in the heart of old town Alghero. We dined on saffron-scented fregula topped with truly fresh seafood, pizza topped with fresh, local cheese, nuts, and pears, and my husband loved the goat carpaccio. The service was so warm and kind, and we even shared a few laughs with the local couple seated beside us. All in all, the two days we spent exploring La Maddalena were two of the best, and here's why: we were alone in nature. We were alone in one of the most stunning, untouched, beautiful places on earth. Here, rock formations had been carved out by the combination of wind, sand, and salt. Mountain goats grazed. Quiet hikes led us to untouched white sand beaches and clear blue waters. We were able to rent a boat without showing a license or any knowledge of how to navigate the seas. We were handed a laminated, illustrated map, and told to be back by sunset. With that, we were off to explore a handful of islands that made tiny La Maddalena look like a city of industry. We docked on our own private beach and noshed on cookies and cheese. The grey clouds had finally lifted, the rain had stopped, there were no sideways looks, no dinner orders, and no gaping toilet bowls. After all we'd gone through to get here, we'd found paradise on Sardinia. If we were going to do it all again, we'd plan to travel in September instead of October, with the hopes that more of the island would be open for business. We'd also skip the inland road trip (despite the beautiful scenery) and instead stick to the coastal routes, where there was more action and more to experience (like hiking in Caprera, boating around La Maddalena, discovering Neptune's Grotto, and sunset at Isola Rossa, to name a few). I've certainly learned that there's a fine line between being spontaneous and not being prepared. I wish I'd known the limits of off season in Sardinia. I wish I'd attempted to book a campsite or an agrotourismo, or even a dinner reservation before we'd arrived, as it may have raised a red flag that so much of the island was closed. Maybe we would have planned to rent a car and book hotels instead of roughing it on the roadside. 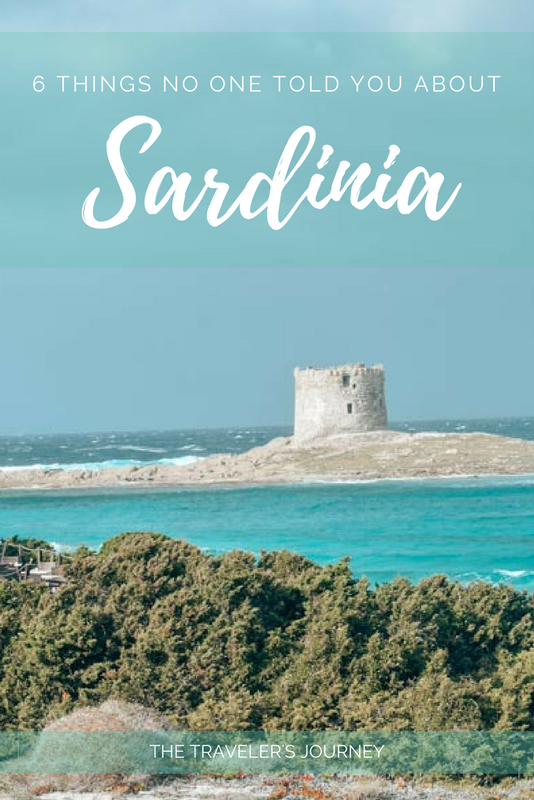 Although the La Maddalenas, the La Botteghinas, the Matteos, and the Antonios and Amandines were few and far between, Sardinia's rare gems are worth seeking out. Hopefully, with my advice, you can plan a trip to Sardinia that's memorable for all the right reasons.